Care to dine on the delicious supper of justice? Well, friend, that's something that you and The Tick share in common. He's the tough superhero, dressed in blue, who never strays from the path of the law. The scaly underbelly of evil better watch it's back... er, belly, when The Tick is on duty. And The Tick is on duty 24 hours a day, 7 days a week. Do you have the unyielding hunger for justice that The Tick has? Well then, friend, put your mask on and shout your battle cry, "Spoon!" 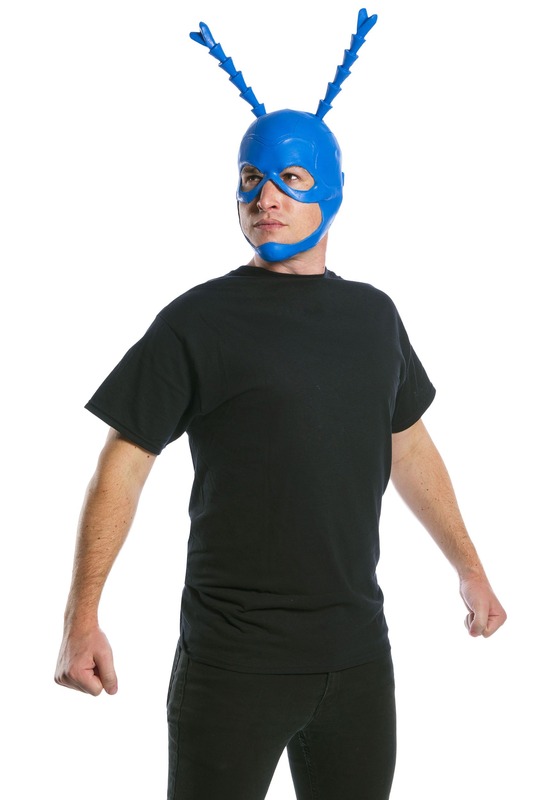 The Tick Overhead Mask is officially licensed from the 2018 television series. It's made out of molded latex and features foam padding in the interior for comfort and fitting. The mask features generous eye openings and it even has the tall dangling antennae, just like in the show. Just put this mask on and you'll be ready to patrol your neighborhood in the name of justice! Of course, your first order of business will be to recruit a timid accountant as your sidekick. After all, your overzealous pursuit of justice may cause a few problems if you don't have someone a little more grounded at your side!